(CNN) -- In June, CNN Living Golf meets the best female golfer in the world, Lorena Ochoa, in her home town of Guadalajara, Mexico's second most populous city. In her 27 years, Ochoa, has racked up 29 professional wins -- 26 on the LPGA Tour and three on the Futures Tour -- and is considered to be the best golfer Mexico has ever produced. Living Golf looks at Ochoa's extraordinary rise up the world golf rankings and her success in raising the profile of the sport in Mexico. 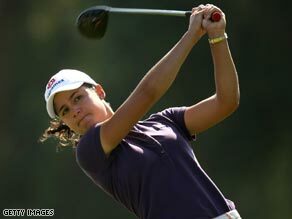 The crew accompanied Ochoa to the 2009 Corona Championship in Mexico where she matched her 2008 winning score of 25-under-par to finish one shot ahead of runner-up Suzann Pettersen. It's her second win of the season, following her victory in the Honda LPGA Thailand tournament earlier this year. She's currently first in the running for this year's Rolex Player of the Year, after taking the title every year since 2006. Living Golf speaks with Ochoa's brother and manager, one of her best friends, her coach, the head of women's Mexican Golf Federation, her fellow LPGA professionals, and of course Ochoa herself. At the time of the interview in Mexico, the Swine Flu outbreak was making headlines around the world. We ask Ochoa for her reaction. Living Golf looks at Ochoa's success off the course and her commitment to helping disadvantaged children on the outskirts of Guadalajara. She is one of the youngest golfers to start her own philanthropic foundation, adopting an elementary school for 241 low-income children near her hometown. Ochoa and her brother Alejandro, who is her manager, have also opened two golf academies and plan three more this year to train and certify instructors and help students across the country. Whilst Ochoa is the most dominant female golf player in the world, it's her personality and her special bond with her compatriots that makes this such a compelling story.